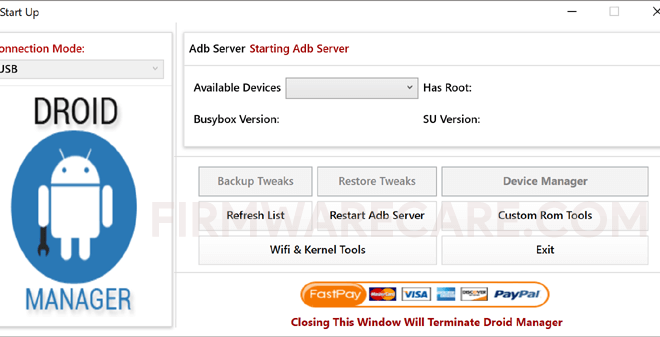 It allows you to check the Root Status of the Android device, Busybox Version, SuperSU version, Backup Tweaks, Restore Tweaks, Restart the ADB Server, Custom ROM tools, Open Device Manager, WiFi, and Kernel Tools. In order to use the Droid Manager, you need to install the Universal ADB Driver on your computer. Once Driver is installed, connect your Android device to the computer using the USB cable with USB debugging mode enabled on the device. Once your device is connected to the computer, launch the Droid Manager Tool and it will automatically show the list of Android devices connected to the computer.